Partners of consulting firm "Technologies of Sustainable Development"
Young firm with about 100 % of Germany capital, the office which one is placed in Kiev city, with each day gains rotational speed, encourages loyalty of the increasing quantity of clients. In conditions of a b competition with the enterprisers of cheap fans it is important to know how to define of advantages, which one the client receives, purchasing production of the corporation. the analysis of a situation in the market demonstrates, that separately taken price of the fan, as one of four tools of marketing not always plays a determining role for the client. It is important to learn to use other three tools of marketing, such as the product, promotion and place. If the computer costs about 5000 hrivhnas $1000), low noise ability is considered as the important parameter of the computer. the client is ready to pay more money for his or her computer that is not only less noisy, but also more reliable. the firm personnel during training have defined, that the fans of the corporation «EBM-Industries Ukraina» provide additional benefits for the client. the makings of corrective amendments into marketing policy have promoted increase of sales. the listed Products of firm include tens naming. the exact calculation of the price on each stands alone position, definition of the marginal income on a separately taken item demand revision of the traditionally existed approaches to pricing. On the first place the maximum address calculation of costs and exception of transfer of variable costs in constant cost (electricity, gas, heat) stand. the addressing of the costs gives the information that the separate items have the negative marginal income and the immediate reacting is required: it is necessary either to increase the price, or to remove an item from the sale. the situation is possible, when on potentially profitable items by reference on its production not appropriate costs, the price is raised too high and these items cannot compete in the market. the exact addressing of costs allows "to rehabilitate" such goods and to augment sales. the prices reconsideration on the basis of minimization of overhead expenses simultaneously with their precise addressing allows receiving fast economical outcome. The corporation " Supra Ltd "
the firm consists of two divisions, which are engaged in different kinds of activity. the first division is engaged in sale of automobile tires, other – in production products from metal. At the same time, despite of differences both divisions have one general feature: the activity of one and other is directed on satisfaction of needs and demands of the clients. As is known, the clients are divided on two categories: external and internal. In an established organization, changing to a customer-driven corporate culture must occur gradually. Furthermore, middle managers alone cannot effect change in corporate culture; they must have the total support of the CEO and other top executives. During trainings, with using a method of brainstorm, the directions, on which one improving is required, were revealed. For example, together with the CEO and managers there was recognized necessity to apply philosophy and tools of marketing not only to external, but also to the internal clients (workers, managers). there was identified needs and demands of the internal clients, and then the measures on their satisfaction are developed. the purpose of such approach - to reduce turnover of the stuff, increase of service and product quality. the analysis have been made together has shown, that the marketing concept well suits for solution of the indicated problems. Using this concept in day-to-day operation the firm meets organizational objectives and the satisfaction of the external and internal customer. It is difficult to conquer leading position on the market of bank services, but it is even more difficult these position to hold. It is enough to say that on rather small space of Poltava city more than thirty banks operate, quantity which one with each year grows. In conditions of an intensified competition PrivatBank permanently cares of improvement of professional skill of bank officers. the potent corporate system of training remains open for usage of external experience. It allows to attract the experienced consultants in an orb of marketing and to enrich own experience by apposition of modern knowledge and experience of consulting firms. Two-way communication model, verbal and nonverbal communication, relationship-rating point scale - all these and many other things with concern was accepted by the young and perspective officers of the bank. the informational - educational center “LASPI"
In an orb of small business load on the chief of the corporation increases multiply. Often changes in the tax legislation, sweeping changes in organization of bookkeeping, and the enactment of the novel about pensions demands from management of corporations spending of huge time and material resources. Simultaneously with it the competition in the market of informational - educational services increases. Engaging of the experienced advisers for the analysis of a current situation, checking of the documentation on conformity to last requirements of the Law is effective and relatively a low-budget way to remain afloat. the time is economized, which one will be used on improving of business, search of new markets for services. It is well known, that advertising in a press, on a wireless and television is rather expensive measure. Simultaneously with mass usage of advertising, the monotony in selection of marketing policies by firms making beer is watched. the chiefs of marketing department of the Poltava's Beer Factory, which one have passed trough long-time training on fatherland of the Law About Beer, perceive, that advertising that many and frequently used in practice is not the most effective tool of marketing. On a high competitive market of beer trained staff can ensure the meaningful perceivable differences of Poltava's Beer Factory product. therefore, it is necessary to renew education with modern knowledge in an orb of marketing. Investing money in training is much more perspective and economically profitable way of maintenance of competitiveness of Poltava's Beer Factory product, than advertising. Using marketing approaches, it is possible to find ways, how to mark out own production from a number of similar, what is the better way to identify needs of clients and to satisfy them, thereby, ensuring competitive advantages of Poltava's Beer Factory products. the situation on the market of alcoholic beverages has a number of features: at first, huge quantity of vodka (by estimations about 50 %) is made in a shade, in other words, illegally; secondly, the population of the Poltava’s area according to the data of State committee of statistics of Ukraina has decreased for last two years almost on 40 thousand persons; in third, massive offensive of the enterprisers from other regions of Ukraina have resulted that in 2002 Poltava’s region has produced of alcoholic beverages only 66 % from total sales of alcoholic beverage in Poltava’s region. Simultaneously with it there are regions in Ukraina, which one in some times produced more production, than have been realized in their territories. It is simply necessary to change marketing policy in activity of Poltava’s plant of alcoholic beverages. the objective factors, about which one there was a speech above, the plus of change in world outlook of the population (in the Poltava’s area quantity of religious communities is growing) demand of search of reserves on the basis both of marketing internal, and external audit. the seminars with engaging of the specialists of a consulting firm, have allowed not only to receive objective market information, but also to see future prospect, that, undoubtedly, is useful at developing of effective marketing tactics and policy. Community of the Poltava’s region is worried with problems of a global warming of a climate. the consulting firm "Technologies of Sustainable Development» considers conducting consultations and developing practical recommendations in an orb of usage of alternative power sources as one of directions of the own activity. the teacher of physics have interested by Web site "Energy of the Sun in Ukraina", which one have designed by the consulting firm "Technologies of Sustainable Development». At seminars with the theme "Energy of the Sun in Ukraina. Realities and prospects for the development", was dedicated to representation of a site, was demonstrated the cap with the micro fan which is set in motion by energy of the sun, and children's toy - revolver. What is common between these subjects and what is difference between them? 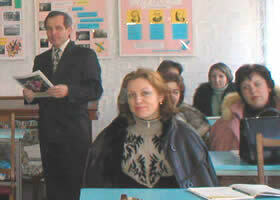 On a seminar the present teachers of physics of the Poltava’s area have found, on our view, right answer. Both subjects - toys. One demonstrates a capability of transformation of energy of the sun in a useful work, and other - one of kinds of weapons. the difference that is: the first toy is absent in shops, and other or similar to it are widely presented. Anybody from present teachers did not doubt that any child would name the second subject - revolver, its assigning and method of application, and anybody from children would not name the first. From this point the formation of self-consciousness of the population concerning relevance of usage of alternate power sources starts. From that, what toys we, adult, offer to our children, thereby, building up the world outlook of children and adults, the future of our country depends. Well known in Poltava city this corporation - enterpriser of furniture and joiner's items always paid large attention to marketing in its activity. Managers of firm “Ukraina Ltd” prefer the following marketing concepts: the product concept, the production concept, and selling concept. However, the hardening of strife for the client has resulted change in comprehension of the situation, and that it is necessary to modify marketing policy. During training with the specialists of the corporation the analysis of past marketing policies is conducted, are analyzed both advantages and disadvantages of each of them. Together with the specialists of the corporation the necessity of usage of the marketing concept was justified. In other words, the operation of the firm it is needed to focus on identification of customer wants and needs, on estimation market volume, then to satisfy customer while meeting organizational objectives. It is based on an understanding that a sale does not depend on an aggressive sales force, but rather on a customer’s decision to purchase a product.